Michael Risher graduated with honors from Harvard College and with distinction and Order of the Coif from Stanford Law School. After graduating from law school, he clerked for Judge Karen Nelson Moore on the U.S. Court of Appeals for the Sixth Circuit. 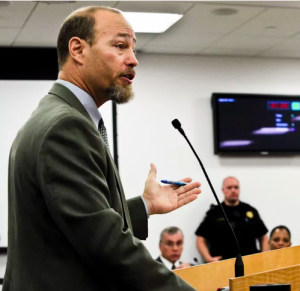 He then served as the legal affairs adviser for the Lindesmith Center and was a Deputy Public Defender in Alameda County from 1998 to 2005, where he litigated cases ranging from minor misdemeanors to murders. From 2006 to 2018 he was a staff attorney and then senior staff attorney at the American Civil Liberties Union of Northern California, where he litigated a broad range of civil-rights and civil liberties cases in state and federal trial and appellate courts. He continues to serve of counsel to the ACLU. Risher was a Lecturer in Law at Stanford Law School in 2015, teaching a course on policing law. He has worked with the California Commission on Peace Officer Standards and Training to help develop a procedural-justice curriculum for the training that all California peace officers must receive. He has testified before Congress and the California Legislature about issues relating to DNA databases, privacy, and free speech and has written about these and other civil-liberties issues. He was the principle author of the ACLU’s U.S. Supreme Court amicus brief in Maryland v. King, involving the constitutionality of DNA databanks. He has appeared on shows such as Democracy Now to talk about these issued and his work. Risher has third-degree black belts in Danzan Ryu Jujutsu and Toyama Ryu Battodo, and a first-degree black belt in Kenpo karate.